KIC InnoEnergy, the European company for innovation, education and business creation in sustainable energy, and Climate-KIC, the EU’s main climate innovation initiative, are today celebrating the success of three of their projects at the EIT Awards, presented at InnovEIT in Budapest last night. KIC InnoEnergy Masters School Graduate Govinda Upadhyay won the EIT Change Award for his design of a simple and affordable solar LED lamp, and the EIT Innovators Award went to EOLOS Floating LIDAR Solutions (CEO Rajai Aghabi), a KIC InnoEnergy supported project, for breaking new ground in the field of affordable wind energy. Climate-KIC startup Nordic Power Converters (co-founder Regnar Paaske) of Denmark won the EIT Venture Award for his imaginative redesign of small, long lasting power converters. And, in a measure of the value of collaboration between partners of the EIT, following on from his graduation from KIC InnoEnergy’s PhD programme, Govinda Upadhyay’s solar LED Lamp project is benefiting from the Climate-KIC start up Acceleration Programme, turning his innovative idea into a business. Diego Pavia, CEO at KIC InnoEnergy, says: “We are delighted by the success of our programme and graduates in these Awards. 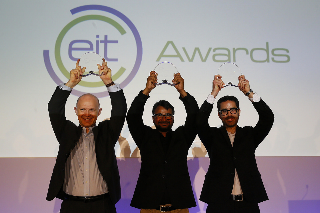 The EIT Awards recognise the best in innovation and each of these projects demonstrates commitment to advancing sustainable growth and competitiveness in the field of sustainable energy. Bertrand van Ee, CEO of Climate-KIC, says: “Indeed it’s all about collaboration: discovering talent and scaling it up.